At Anglec safety is our top priority. We are committed to helping you keep your family and homes safe from electrical accidents caused by bad weather or unsafe conditions. The following safety tips are dedicated to help and inform our customers. You can help us protect you from electrical accidents by taking a few minutes to explore this section and by checking for unsafe conditions around your home. Electrical appliances use a large amount of electricity and can be the source of electrical fires or electrical injuries. Appliances that create heat should also be approached with extra caution. Space heaters or hot light bulbs should be kept away from anything flammable. Halogen light bulbs can get much hotter than normal light bulbs, so if you have halogen lamps anywhere in your home, make sure there is nothing too close to them that can burn. The only appliance that you will likely have to run all the time is the refrigerator. Electrical appliances should never be used near water; for example do not blow dry your hair near the tub or sink which is filled with water. If your home is flooded, seek professional help after the water clears to ensure that it is safe to use electricity. Old, worn-out appliances and wiring can present an electrical safety hazard. If you have old appliances, you should constantly inspect them for flaws or damage. Old appliances are often less efficient than newer ones, so it can be a good investment to replace them. Any wiring that is frayed or bare should be replaced immediately. Ensure that you connect your computer to a surge protector to protect it during periods of power outages and storms. Do not plug too much equipment into the surge protector. It is important that the computer is grounded to avoid power jolts, so make sure it is plugged into a properly grounded, 3-prong outlet. Ensure that cords are not overloaded. Additionally, extension cords should only be used on a temporary basis; they are not intended as permanent household wiring. Make sure extension cords have safety closures to help prevent young children from shock hazards. Electric-powered lawnmowers and other tools should not be used in the rain, on wet grass or in wet conditions. Inspect power tools and electric lawn mowers before each use for frayed power cords, broken plugs and cracked or broken housings. If damaged, stop using it immediately. Repair it or replace it. Always use an extension cord marked for outdoor use and rated for the power needs of your tools. Remember to unplug all portable power tools when not in use. 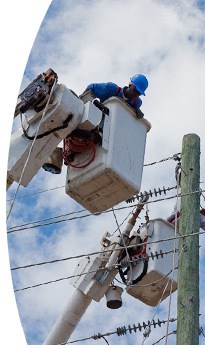 Since metal ladders conduct electricity, watch out for overhead wires and power lines.